If you’re in the market for a workstation PC, we can assume that you’d have certain demands. It’d need to be fast, of course, but also stable – regardless of the workload. BOXX promises to deliver on both points in spades, and can offer a number of reasons for it. We’ll explore those as we take a hard look at the APEXX 4. BOXX calls itself “The Professional’s Choice”, which is quite a grand statement. But to its benefit, the company has a long list of bullet-points to help back that up. At the forefront? BOXX takes things as seriously as you do. Whether you’re a content creator or researcher, there’s no such thing as choosing a low quality workstation. It’s imperative to have one that’s fast enough for the job at hand, is stable, runs cool, and of course, will last. BOXX believes that there’s no one better to deliver on those points than it can. A couple of months ago, I was fortunate enough to be in Austin, Texas for a conference, and was able to pop on over to BOXX’s headquarters for a chat and a look-around. From that visit, one thing stood out: the company’s small RMA department. When asked about it, my host was quick to give me a reason for it: the company’s engineering team is larger. Outside of its collection of preconfigured machines, no BOXX workstation configuration is set in stone. With the APEXX 4, customers have the option to go with a build that offers the best CPU frequency, or one that packs in the most cores. Which route is the best one to take depends entirely on your personal needs. While a CAD designer would probably be best off with higher CPU frequencies, those encoding or rendering large projects might benefit from additional cores. If figuring out the best configuration for your particular need proves difficult, BOXX’s support team can help, either through the live chat feature on its website, or by phone. If you choose to go with the option that has the highest CPU frequency, you’ll be receiving Intel’s Core i7-5960X eight-core processor, which is overclocked to 4.125GHz. BOXX offers just a single CPU option here because it’s put engineering effort into testing batches of these chips to be able to validate that overclock. If “overclock” sounds scary, it shouldn’t: BOXX guarantees 100% stable operation for the life of the system. A configuration like this one is ideal for those who need both a super-fast CPU and GPU. NVIDIA’s Quadro M5000 is the second-best in its current lineup, sporting 2,048 CUDA cores and 8GB of GDDR5 ECC memory. This correlates to good gaming performance at up to 1440p resolution, and a huge amount of horsepower for creative projects. Those with memory-heavy projects or those who need the best possible performance from a single GPU would want to opt for NVIDIA’s Quadro M6000, which offers 24GB of GDDR5 ECC memory and 50% more cores than the M5000. Most of the configuration here speaks for itself, but I’d like to draw attention to the super-fast SSD included, Intel’s SSD 750. By now, we’re all very familiar with the benefits SSDs offer, but an SSD like Intel’s 750 takes things to the next level. While a typical SATA-based SSD will top-out its read and/or write at about ~500MB/s, Intel’s SSD 750 can almost quintuple the read and double the write – as you’ll see later. Not everyone needs this ridiculous speed, but if your projects are at all I/O heavy, I’d implore you to consider opting for a solution like this. Overall, the name of this configuration is speed (not literally! ), but before we get into benchmarks, let’s first take a good look at APEXX 4 itself. I mentioned in the intro that BOXX takes things seriously, but just how seriously is that? Well, considering the fact that the company is one of the rarer boutique builders to design their own chassis from scratch, I feel safe in saying very serious. BOXX has been proud of the fact that it designs its chassis in-house, and doesn’t even mind admitting what software it uses to do so: Dassault’s SolidWorks. 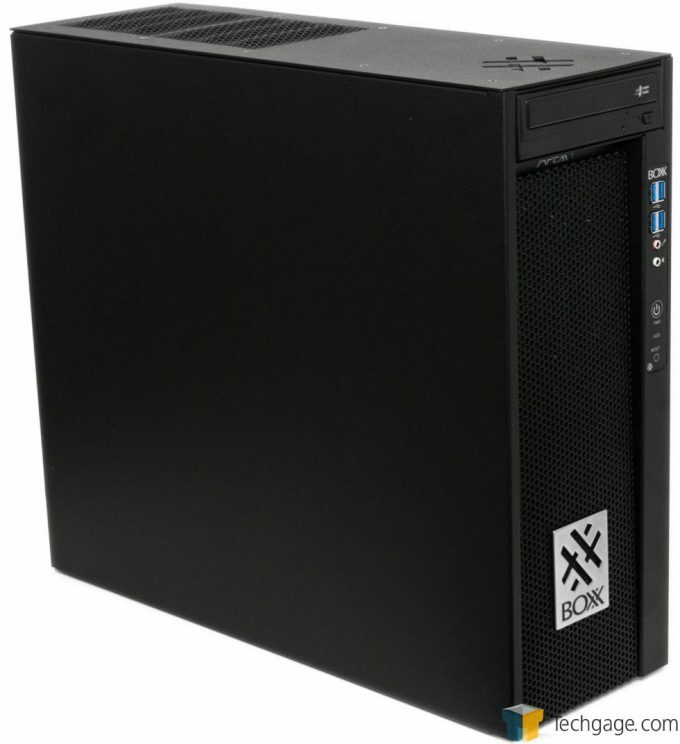 What makes that fact interesting to me is: BOXX uses SolidWorks to design its chassis to sell better-optimized systems to customers that use SolidWorks – and myriad other software, of course. Whenever a new chassis design is finalized and needs to be built, it gets fabricated less than an hour away from BOXX’s headquarters in Austin, Texas. The APEXX 4 is an ATX form-factor workstation that can convert to a rackmount form-factor with an additional purchase. Despite the high-performance gear that graces its interior, the chassis is quite compact; almost unassuming. At the top of the APEXX 4 are two fan exhausts, which feature a wavy grating over the top. While the waves serve no real purpose outside of looking cool, their design would prevent the PC from getting its airflow at the top cut off due to someone setting something on it. While most desktop-style PCs usually have the I/O panel at the top, the APEXX 4 was designed to keep the hottest components up top, which relegates the peripherals to the bottom. Another custom touch is with the PCIe slots; BOXX designs its own brackets for the empty slots that aim to improve air circulation. Because BOXX designs its own chassis, it’s able to orient the APEXX 4’s components any way it sees fit. That leads to some interesting features, such as a bracket that holds the graphics card steady (especially important during transport), an all-in-one liquid CPU cooler affixed to the inside front, and a motherboard that’s upside-down, so as to keep the hottest-running components higher in the system. The APEXX 4 supports four full-sized SATA drives, and for the sake of ease, it ties some SATA power cables beneath the bays, ready-to-go. Beneath these bays is a PCI slot connected directly to the chassis. This is not routed to the motherboard in any way, but is there to be used in case a card that doesn’t have data contacts needs to be installed. An example would be NVIDIA’s Quadro Sync card. Before moving on, one thing I will say about this chassis (despite saying it already) is that it’s “optimized”. That’s not just some word I’m throwing around; as I found out through exhaustive testing, the APEXX 4 is optimized to the point where it helps components run at their fastest because heat is so effectively handled. Here’s an example of why this can matter. One day while testing, it was quite hot outside, to the point where the window-mount air conditioner couldn’t keep up. Desperate to cool things down, I decided to stop the ongoing (4-hour) benchmark that had been running on the APEXX 4. That was until I felt the back of the PC. The warm air exhausted was cool enough to the point where I decided to just let the benchmark finish, because I didn’t feel that turning the system off would have made much of a difference. 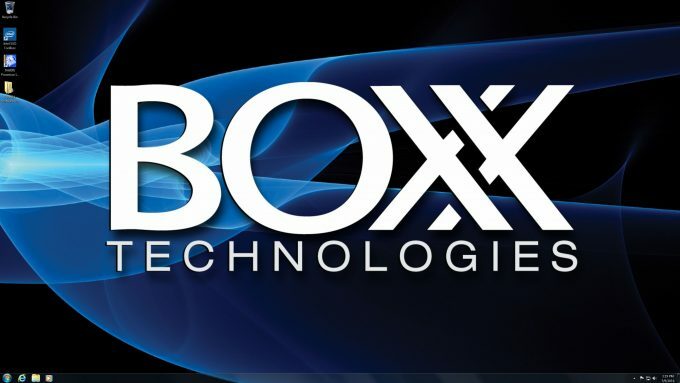 BOXX ships its PCs with the cleanest software configuration I’ve ever seen. The OS is left as stock as possible, with BOXX logos branding a few dialog boxes. Outside of Teradici PCoIP software, the only thing preinstalled by the company are hardware drivers and the software that might come with them (eg: Intel SSD Toolbox). It’s important to note that while BOXX can ship a PC with Windows 7 installed on a PCIe SSD, it’s not an implementation supported natively by the OS. That means the OS can’t be easily restored to factory settings. In the event you need to do that, you could go the manual route with the help of DIY guides, or work with BOXX to get a replacement preconfigured drive. I’d personally recommend opting for Windows 10 over Windows 7 for this and other reasons, as long as the software you use is validated for its use. 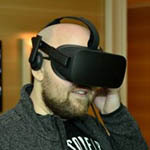 Windows 10 will especially be important to those who plan on using DirectX 12, either for content creation or gaming, as Windows 7 simply doesn’t support it. BOXX has chosen ASUS’ X99-E WS/USB 3.1 workstation motherboard for use in its frequency-focused APEXX 4s. This is an extremely robust board that’s purpose-built for workstation use. That doesn’t mean that it’s boring, though; it can handle up to 4x full-sized graphics cards (unless PCIe SSD storage is used), a slew of USB 3.0 and 2x USB 3.1 10Gbps ports, and dual Ethernet ports, to name a few. The chances of you needing to go into this EFI are quite low, but in the event you do need to, it’s nice to have one that’s well-designed. From the first screen, or “Main”, you can view some important motherboard information. To view temperatures and voltages, you’d simply need to navigate to the “Monitor” menu. Should you have options you refer to often that are not easily found after entering the EFI, you can add them to the “My Favorites” section with a hotkey. With the hardware and software tours taken care of, let’s move onto a look at performance.